Brand new stories by: George Pelecanos, James Grady, Kenji Jasper, Jim Beane, Jabari Asim, Ruben Castaneda, James Patton, Norman Kelley, Jennifer Howard, Richard Currey, Lester Irby, and others. "From the Chevy Chase housewife who commits a shocking act to the watchful bum protecting Georgetown street vendors, the tome offers a startling glimpse into the cityscape's darkest corners...Fans of the noir] genre will find solid writing, palpable tension and surprise endings." 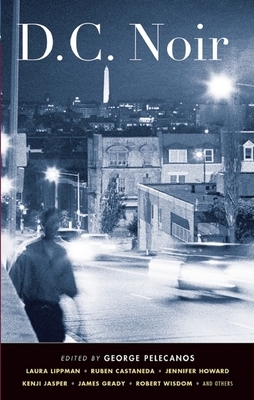 "Every story in this all-original noir anthology set in the nation's capital is well-written." "Imbued with countless collective years of local experience." " Pelecanos] has assembled a compelling mix of ex-convicts, retired police officers, former crime beat reporters and a few writing pros willing to turn their storytelling eye, whether jaundiced or tender, inward toward the neighborhood...Local haunts and hangouts are lovingly drawn." "Pick up a copy of the book D.C. Noir...and prepare to be transported to a different D.C. that the tourists see...Pure Washingtonian." "Those looking for redemption in humanity would do well to look elsewhere, but this set of gritty urban tales, written with all the requisite touches of shadow and fog of the noir masters, is a rare cut for crime aficionados and should pique the interest of anyone who calls the Dark City home." George Pelecanos is an independent film producer, the recipient of numerous international writing awards, a producer and an Emmy-nominated writer on the HBO series The Wire, and the author of a fifteen novels set in and around Washington, D.C. He is the editor of the best-selling first volume of D.C. Noir.